If you’re a snowboarder, you’re in good company. 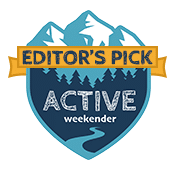 Nearly 8 million people participate in this activity which is almost as many as alpine and cross-country skiers combined. Aside from your snowboard, your helmet is the most important piece of gear you’ll buy. Think of it as life insurance. It’s an unfortunate fact that beginners have the greatest risk of injury. One of the best ways to stay safe is to wear a helmet. Besides that, it’ll keep you warmer by covering your head and ears. And while you’re at it, eye protection is smart too. After all, you’re moving at fast speeds that don’t give you a lot of time to make decisions if you come across a hazardous situation. Let’s do a deep dive into what you need to know starting with our favorites. Quick Answer: What are the best ski & snowboard helmets for beginners in 2018? You can expect to pay anywhere from under $50 to $300 or more for a snowboarding helmet, depending on the specs. We considered a wide variety of styles and price points to come up with our favorites. Let’s look at each one in detail to see what makes it stand out from the rest. 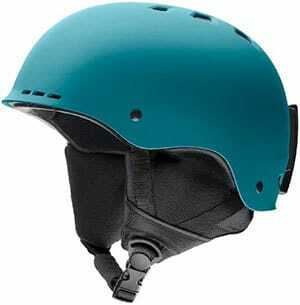 The Smith Holt Helmet is an injection-molded model with bombshell construction and an EPS liner. Comfort is the best description for this one with 14 vents to keep you cool. It doesn’t have a brim or visor, so goggles are a must. It is lightweight with the men’s model coming in at 1 pound, 3 ounces. It fit as expected which is always a plus in our book. You can play your soundtrack when you hit the slopes with Skullcandy audio systems compatibility. It’s very comfortable with plenty of foam and removable ear pads. Its solid construction offers great protection. Some users may find it a bit too warm for certain conditions. The fit system could do a better job of getting the size right if you opt to forgo the ear pads. The clamp for your goggles is clumsy to use. The Smith Holt is a decent value for the money for a helmet that makes comfort its priority. And it gets our editor selection as the best snowboard helmet with audio due to the Skullcandy audio systems compatibility. Hands down, this is one of the best snowboard helmets for the money right now. The Giro LEDGE Snow Helmet is also an injection molded model with a hard shell construction and eight vents to keep the air flowing nicely. Both the goggle retainer and ear pads are removable. It’s also compatible with Giro audio systems for making those solo jaunts more enjoyable. It uses a removable Auto Loc 2 Fit System and fits as expected. You can buy this snowboard helmet in both men’s and women’s models. The helmet is available in 11 colors to match your other gear. The design and placement of the vents minimize fogging. It is CE EN1077 certified. The chin strap isn’t comfortable and causes chafing. The helmet may feel bulky to some users. The Giro LEDGE is a good value for a budget-friendly product with solid construction and great ventilation. This is also another good option for a snowboard helmet with audio. And it’s affordable price makes it one of the best snowboard helmets for beginners. The Pret Cynic X MIPS Snow Helmet is one of three products we reviewed that features advanced technology. 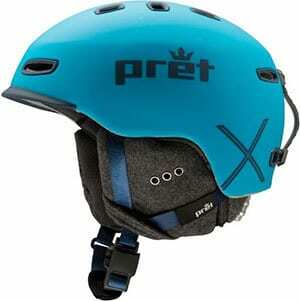 Pret Cynic X MIPS Snow Helmet has the MIPS technology which offers a greater range of protection for the user. It has an in-mold construction with a polycarbonate shell. It was the lightest of the helmets we considered at under one pound. It is both ASTM F 2040 and CE EN 1077 compliant. The ear coverage is well-designed so as not to interfere with the helmet’s fit. It has a washable liner. Yeah! The added features come at a price that puts it into the higher end of the price spectrum. The color choices are limited and don’t include a lot of variety. The liner is made of wool which may be a deal breaker for some users. The Pret Cynic is a helmet meant for the serious enthusiast. It has some extra safety and comfort features that the intermediate snowboarder will appreciate. The POC Auric Cut Backcountry Spin Snow Helmet features the manufacturer’s rotational impact protection system (SPIN) for added protection. It has an injection-molded construction with an ABS plastic shell. We liked the gel pads which make it more comfortable to wear than comparable models. The fit was snug for added safety. Ventilation is fantastic with adjustable vents. It has the Integrated Recco® reflector to make finding you easier in a rescue situation, though we hope you’ll never need it. The helmet exceeds with the comfort level. The company name on the side of the helmet is large and may turn off some users. The two sizes have a wide range. The advanced technology will cost you more. 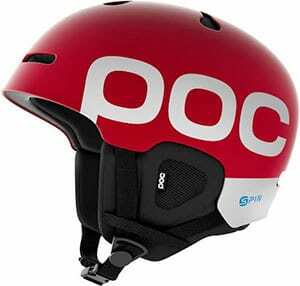 The POC Auric is a comfortable helmet with some extra safety features that make it worth a look. With an innovative rotational impact protection system (SPIN) that reduces the effects of an oblique fall, the POC Auric Cut Backcountry SPIN snow helmet offers stalwart protection for serious riders. It gets our top pick for the best snowboard helmet for intermediate to advanced snowboarders. 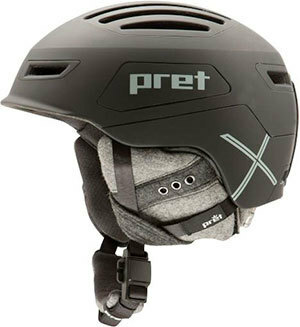 The Pret Corona X MIPS Snow Helmet takes the design to the next level with an in-mold design with a polycarbonate shell and carbon plates. They increase its protection level while reducing the weight. It weighs in at just over one pound. It has a great ventilation system with adjustable front and rear vent channels to keep you comfortable. The liner includes materials that reduce bacterial growth. It has both ASTM F 2040 and CE EN 1077 certification. The extra features come at a price that may put in out of the budget for some users. The color choices are limited. There is a relatively large range within each size. The Pret Corona is an investment worth the investment with the extra safety features and safety certifications. Offering supreme comfort in a wide range of conditions, the women’s Pret Corona X MIPS snow helmet is mapped with front and rear vents that stealthily release heat even when the channels are closed. We’d be remiss if we didn’t at least mention how essential it is to wear a helmet when snowboarding. Let’s look at the facts. There were 33 catastrophic injuries at ski areas in the 2016-2017 season, according to the National Ski Areas Association (NSAA). That includes things like paralysis or severe head trauma. There were also 44 fatalities. While the majority of the incidences involved skiers, the message for snowboarders is still important. Even a single injury or fatality caused by not wearing a helmet is too many. The good news is that usage has skyrocketed from 43 percent in the 2007-2008 season to 83 percent for 2016-2017. That helps to explain the decrease in these tragedies in recent years. To be clear, wearing a helmet is a license for reckless activity or hot dogging it on the slopes. People still get injured even when wearing one. However, you’ll reduce your risk of a more serious consequence if you have a lid. 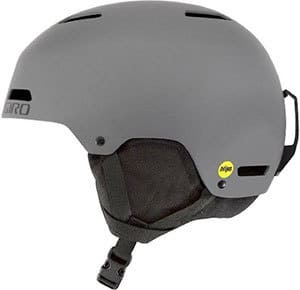 You’ll find that looking for a helmet for snowboarding is not unlike getting one for bicycling. The same principles of a good, snug fit apply. It won’t help if it’s too big or too small. Think Goldilocks. The design and technology have improved vastly in recent years. You find a wide range of styles and types sure to match the rest of your gear and snowboarding style. 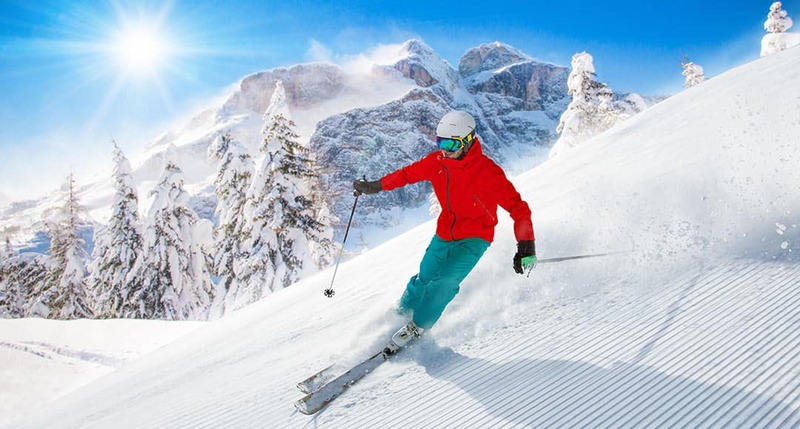 The American Society of Testing Materials is the agency responsible for the safety certification that you’ll see on helmets used for non-motorized snow sports. Snowmobiling is something entirely different. You may also see other ones from other organization such as the Consumer Product Safety Commission (CPSC) or European Committee for Standardization (CE EN). Chances are that if you buy it at a reputable sporting goods dealer, you’ll see one with the ASTM F2040 certification. You may also see the CE EN certification instead. It means that the helmet passed testing for strength retention and positional stability (roll off). Look for the label on the inside of the helmet. We prefer a model that has this designation. You’ll see additional hallmarks of the advancing technology in the specs too. For example, some helmets may include mention of MIPS. Multi-Directional Impact Protection System recognizes the fact that the force can come from any direction, especially when you’ve been hit while in motion. It’s an option with other sports equipment like bicycling. And it will increase the cost too. The essential thing to remember with EPS snowboard helmets is that they’re designed to handle a single incident only. One and done. That means you’ll have to replace it if it gets damaged even without a fall on the slopes. The exception to that rule is one with an EPP liner. These models can take more than one hit as long as they aren’t too bad. The helmet includes a rigid shell and a liner. The shell will offer some protection against things coming in contact with it, while the liner will absorb the impact. There are two kinds of construction, hard shell and in-mold helmets. Each one has its advantages and disadvantages. The former typically includes an EPS foam core encased in ABS plastic. You’ll also see them called injection-molded helmets. These products are quite durable and can handle rough use. The latter includes a shell that is molded onto the liner. Its main advantage is that it’s lightweight than other models. You may also see hybrids made of other materials as well as soft shells. We’d advise you to give a pass on the latter because of a lack of safety certification. You’ll see similar fit systems as you would with a bicycle helmet. One of the more popular kinds is the adjustable wheel on the back of it. It’s convenient for quick changes while wearing it on the slopes. A variation is the in-form type which you ratchet to the right size. Some helmets use old-school methods like pads to add some extra cushioning. Vents are important even with a winter sport. A 175-pound person will burn 486 calories an hour while snowboarding. The best snowboard helmets have adjustable ventilation so that you can match the air flow with your activity level and comfort. You’ll see several variations on this theme including plug, sliding mechanisms and fixed holes. They vary in the amount of coverage on your head. A half-shell model will provide protection for your ears and the back of your head. The full-shell will cover the sides completely. Finally, the full-face will extend out from the base and resembles the one you’d use for bicycle motocross or BMX. The price increases with the type as you may expect. However, other features will also come into play too. Our advice is to go with the full models if you race or do a lot of trick maneuvers on the slopes. Now that you know what to look for, it’s time to pull out the tape measure and see what size you’ll. The size scales will differ with the manufacturer. However, most use centimeters rather than inches. You should measure at the largest part of your head which is about one inch above your ears. That figure is what you’ll need to get you in the ballpark of the right fit. Remember that the helmet will have some type of fit system or at least liners to get the size correct. It should sit snug on your head but not so tight that it leaves marks on your forehead. It still has to be comfortable. A good way to test it is by shaking your head which sort of replicates what you’re doing on the slopes. If it moves a lot, it’s too loose. You’ll also need to make sure that your forehead is protected by the helmet. Ideally, it will rest about one inch or less above your eyebrows or on the top of your goggles. You are wearing eye protection, right? That applies no matter what type you have. Then, there’s the chin strap. The first rule is that you’ll always fasten it before you go snowboarding. It should also fit snug but not so much you feel like you’re being choked. You should be able to move your mouth freely to talk or take a drink. Your helmet is only as good as its fit and condition. Remember that it’s the only thing between your head and the hard ground. Inspect it every time you use it to make sure it’s still in decent shape with no cracks or excessive wear on the liner or chin strap. Even the best snowboard helmets won’t protect you if you are reckless on the slopes as we’ve mentioned earlier. The faster you go, the more force there is behind an impact. Your lid can only do so much if you’re taking a lot of risks. Be smart and stay alert to hazards and other people on the slopes. And most of all, don’t snowboard without your headgear. Snowboarding is an addicting sport that delivers a rush of excitement every time. Few other activities can match it. But if you’re going to go out, please be safe. Your snowboarding helmet is the best protection you have for preventing a serious injury or worse. Think of it like the seat belt of winter sports. Don’t leave home without it.